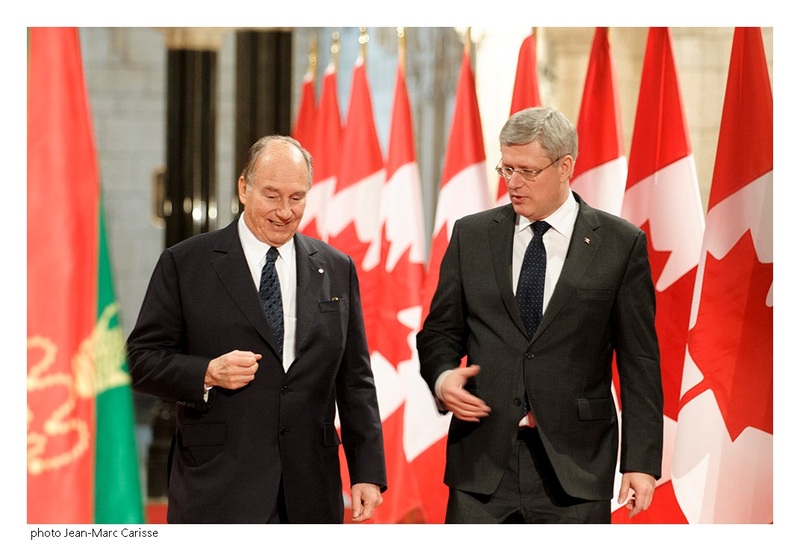 The following English translation of selected parts of His Highness the Aga Khan’s speech on February 27, 2014 to the Canadian Parliament which were in French was obtained from the live translation that was provided during the broadcast. ….Thank you again, Prime Minister, for your invitation. It is for me an unprecedented honour. It is a feeling, a profound feeling…because I have been told that this is the first time in 75 years that a spiritual leader has addressed the Senate and the House of Commons together as part of an official visit. 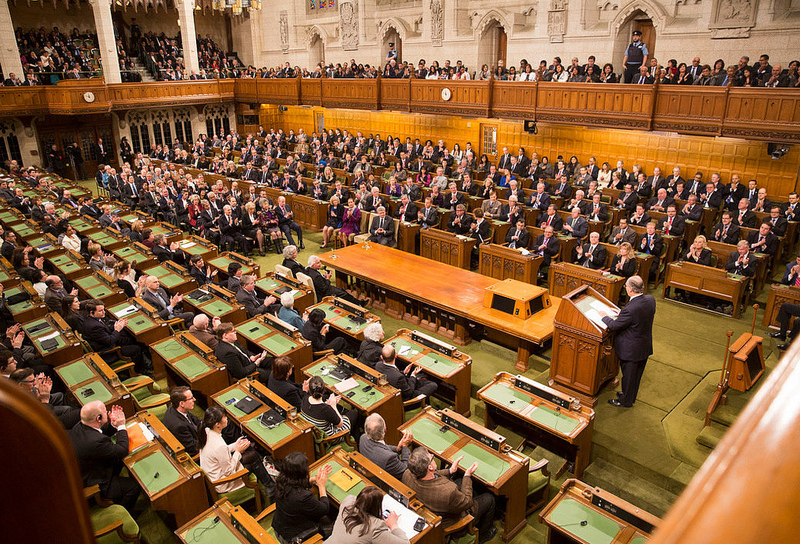 It is, therefore, with humility and awareness of eminent responsibility that I address to you today, elected representatives of the Federal Canadian Parliament and in the presence of other Senior Federal Officials. I have the great privilege of representing the Ismaili Imamat — this institution which has stretched beyond borders for more than 1400 years and which defines itself and is recognised by an increasingly large number of states, as the succession of Shia Imami Ismaili Imams. As the 49th Imam, I have for the past 50 years, looked after two inseparable responsibilities: overseeing the spiritual wellbeing of Ismailis, as well, at the same time, as focusing on improving their quality of life and that of the people with whom they live. Even if there was a time when Ismaili Imams were also Caliphs — in other words, Head of States, for example in Egypt during Fatimid times — my duties today are apolitical. All Ismailis are first and foremost citizens of their countries of birth or adoption. The reach of the Ismaili Imamat is, however, much larger than it was at that time since it is active today in many regions of the world. It is from this perspective that I will share with you some thoughts with you that I feel are worthy of your presence here today. His Highness the Aga Khan and Prime Minister Harper in a conversation as they proceed to the signing ceremony of the protocol of understanding between the Ismaili Imamat and Canada. They are flanked on either side by the flags of the red and green flags of the Ismaili Imamat and the maple leaf of Canada. Photo: Jean-Marc Carisse. Copyright. Allow me at this point to address you again in French. I have just spoken about the incomprehension that exists between industrialised world and Muslim world and about how opposing forces have undermined relations with the great traditions of Islam. Yet, our hearts, our minds, and for many, our faith, tell us that harmony is possible. In fact, recent developments are an indication of this. I would like to say how important constitutional development is in correcting the inability of several existing constitutions to match the evolution of societies, especially when these societies are evolving. This is a fundamental issue that, given my responsibilities, I cannot ignore. You maybe surprised to learn that 37 countries throughout the world have adopted a new constitution over the past 10 years, and 12 are at an advanced phase of modernising their own constitutions. That is a total of 49 countries. In other words, this movement involves a quarter of the UN member states. Out of that 49, 25 percent have a Muslim majority. This shows that there is now no turning back from the demand by civil societies for new constitutional structures. I would like to take a moment now to speak to a specific political difficulty that involves the Muslim world. Religious parties, by their very structure, are based on the principle of inseparability between religion and daily life. The consequence of this is that when it comes time to negotiate constitutional terms with those who want separation between state and religion, a consensus of overarching legislation becomes very difficult to reach. 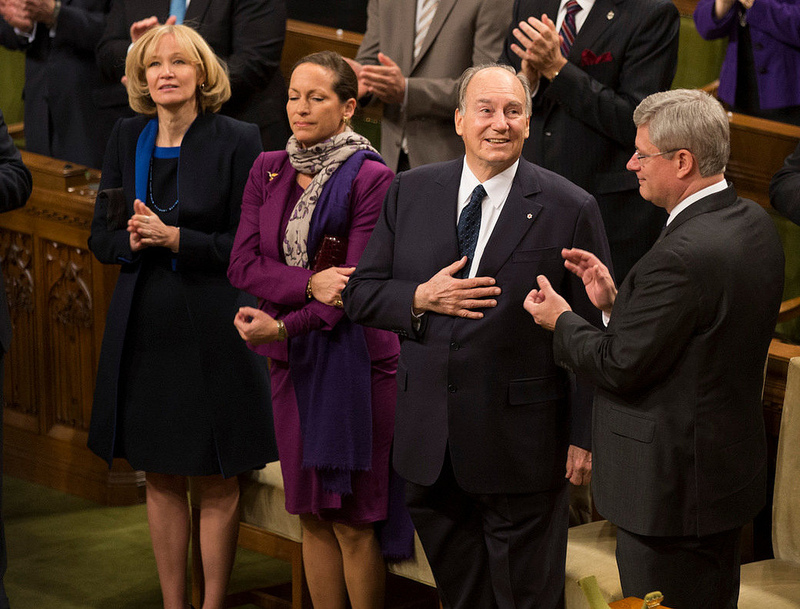 His Highness the Aga Khan seen addressing at the House of Commons Chambers to both the houses of Canadian Parliament on Thursday, February 24, 2014. Photo credit: The Office of the Prime Minister of Canada. However, there is one country that has shown us now that this is possible, and that is the Tunisian Republic. Now is not the time or the place to go into details on its new Constitution, however, allow me to point out that this is the outcome of a responsible pluralist debate, and that it appears to contain the necessary rules to ensure mutual respect between the various parts of civil society. This is reflected in, among other things, a use of notion of coalition, whether that be at an electoral level or government level. This is a great step forward for the kind of pluralism that Canada and the Ismaili Imamat have been hoping for. Allow me also to make note of a hopeful outcome of these developments. That is that the forum for debate and conflict within any pluralist society no longer has to be the street or square, but that it can be the constitutional court of a state’s law. 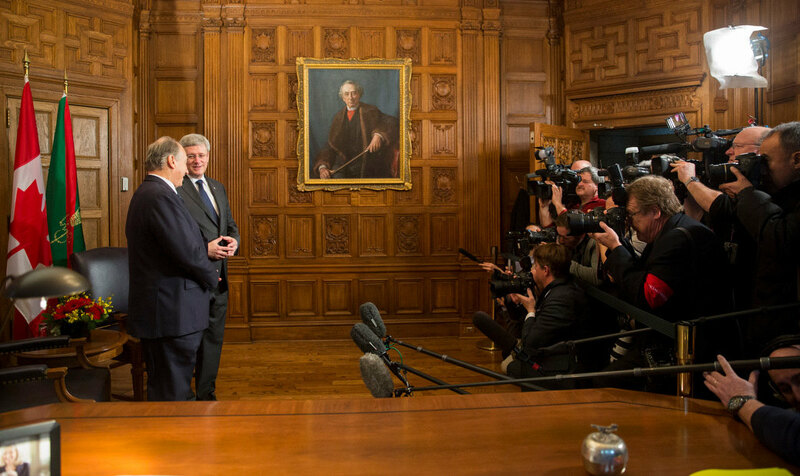 His Highness the Aga Khan and the Right Honourable Stephen Harper, the Prime Minister of Canada, face eager cameras at the Canadian Parliament Building on Thursday, 27 February, 2014. An oil on canvas painting of The Right Honourable Sir John Alexander Macdonald, Prime Minister (1867-1873; 1878-1891) adorns a wall as part of the House of Commons Heritage Collection, while the Ismaili Imamat and Canadian Flags form a backdrop in this historical photo. Photo credit: The Office of the Prime Minister of Canada. Besides the genius of Tunisian constitutionalists, the preparatory work of this involved consultations on comparative Constitutional Law. And I would like to acknowledge in particular the role that the Portuguese legal experts have played, citizens of the country that I greatly admire and that, like Canada, has developed a civilisation of mutual respect between communities and openness to religions. I am referring here to the law regulating the relations between the Portuguese Republic and the Ismaili Imamat since 2010. I am very pleased to add, before this very honourable audience, that this law was unanimously passed and it recognises the nature of the Ismaili Imamat as being a supranational entity. It may be noted that the late Prince Sadruddin contributed immensely to the settlement of the Jamat (and others) in Canada during the early 1970’s. The social, economic and cultural development projects by the Agakhan Development Network in Canada, through Aga Khan Foundation Canada, under Mawlana Hazar Imam’s leadership since then is not only Divine but mesmerizing!—MASHALLA!